I've got 500GB of M4V video files on my computer, and I want to shrink them. The problem is, any time I try to compress M4V file size, the output turns out bigger. I'm on a Mac and I'd like to make M4V files smaller without sacrificing much quality. How to compress M4V video files? Does video resolution matter? Yes. Does bit rate matter? Yes. Follow our guide to fast reduce M4V files size without losing quality for email, sharing, uploading, transferring. 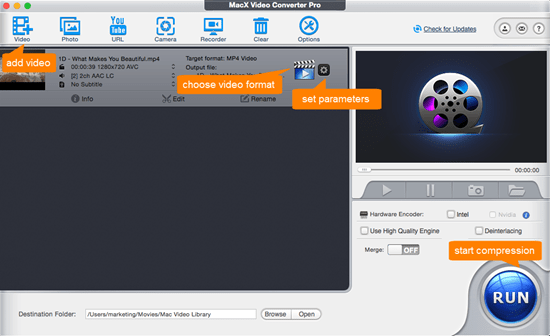 MacX Video Converter Pro is a reliable M4V compressor program we'd like to recommend for the following reasons. 1. Reduce M4V video files in batch with blazing fast speed (30 seconds only to shrink a 300MB M4V file). 2. Shrink M4V files to the hilt, by up to 90%. 3. Built-in High Quality Engine guarantees high-quality output. 4. Offer several choices to shrink M4V file size, like converting format, lowering resolution/bit rate/frame rate, trimming/cropping M4V videos etc. 5. Convert and compress M4V files to MP4 etc. format accepted by non-Apple Android devices, media players. 6. No limits on the length, file size and number of videos users can convert. It's very easy to shrink M4V with this tool, thanks to well-designed user interface. Follow steps below to start to make M4V file smaller for emailing, sharing, uploading to YouTube, FaceBook etc. Step 1: Run the high quality free video compressor for Mac or Windows on your computer. Click Add Video icon in the top-left corner and select M4V video files to shrink. The tool supports to shrink M4V files in batch. Step 2: Start M4V compression on Mac or PC. You have several ways to reduce M4V file size. * Convert M4V to other smaller-sized format. For example, you can convert M4V to MP3/AAC/AC3 audio and cut down M4V by up to 90% without losing quality if you only want the separate audio file. 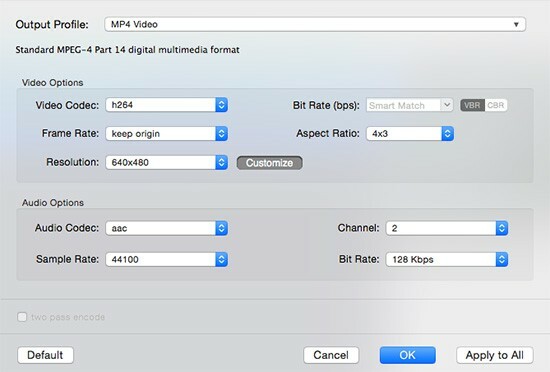 * Adjust M4V video parameters to narrow file size, then click OK. Lowering bitrate can cut down video file size. Click Resolution to convert 4K to 1080p, 1080p to 720p, or even lower. Trim M4V video to remove unwanted part to abridge M4V file size without losing quality. The M4V compressor also works as a video splitter that can be used to split large M4V files into separate parts for emailing or sharing. Step 3: Click "RUN" to start resizing M4V file on Mac/Win without losing much quality for emailing, sharing etc. The program is good option to compress MP4, MKV, AVI, MOV, WMV, 4K UHD/1080P HD video file size. Online converter is a good way to go for M4V video file size reduction. 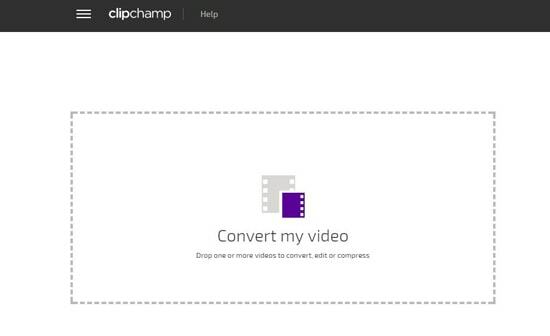 We recommend Clipchamp, an easy-to-use and well-designed free but limited online video compressor tools. 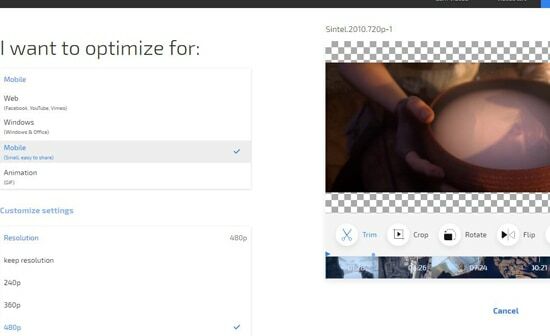 It offers basic options to resize M4V online free, like lowering down video resolution/quality, video trimming. Note that the free basic version is limited for personal use - 5 videos only per month. Use step below to try to shrink M4V online to smaller file size with good quality. The steps are applicable to compress MP4 videos online and shrink MKV, WMV, AVI, etc. Warm note: if the M4V video you want to shrink is encrypted, use DRM media converter to convert M4V to MP4 or other DRM-free format before you start. Step 1: Open the clipchamp site, sign in with your Google account. Step 2: Click the button on the left to select one or more M4V video files, or directly drag M4V videos to cut down online. Step 3: On the left side, select Mobile (Small, easy to share) under "I want to optimize for:" tab. Then click Customize Settings and select lower resolution to resize M4V online free to smaller file size for free, and select Low or Medium under Quality drop-down menu to cut down M4V file size. One of the most efficient ways to compress M4V file size is to lower down the resolution. But make sure that you have a good balance between small file size and quality. The Format is automatically set to MP4, which doesn't help compress M4V video size at all. Step 4: Click EDIT VIDEO tab under the video you load on the right side of the online M4V compressor. Select "Trim" function, and cut unwanted part to shrink M4V video file size. Step 5: After all the steps are done, click Start and click UPLOAD & Share icon to share shrinked M4V file to YouTube, Vimeo, Facebook or store it on Google Drive for emailing, sharing etc. MacX Video Converter Pro, the best M4V shrinker can fast reduce M4V video to smaller file size without losing much quality for email, sharing, uploading, transferring etc.